Award Pins - gold-plated, enamel filled, and made in the USA. Give your students the award they deserve at a very affordable price! 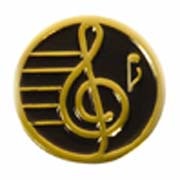 These treble clef pins are 3/4" in diameter and are made from die-struck solid brass, goldplated, then filled with a vibrant enamel color. These pins have a modern elegance and look like they should be worth twice the price, allowing you to honor more students for less. Best of all, they are quality-made in the USA.